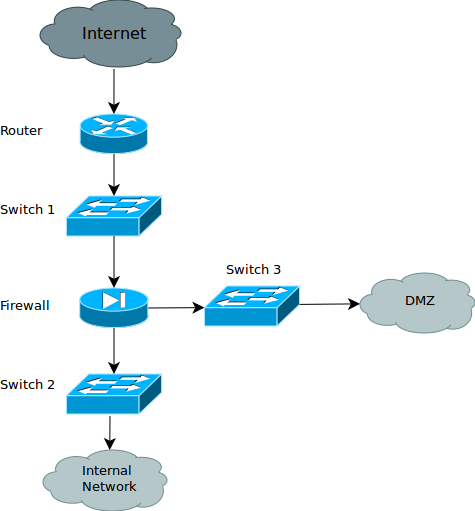 The above network is a reasonable abstraction of an enterprise one. So in the following picture i try to place the candidate sensor positions (From A to F) and replace DMZ with a Debian machine (running an FTP, HTTP and SSH server) and Internal Network with a Windows machine. 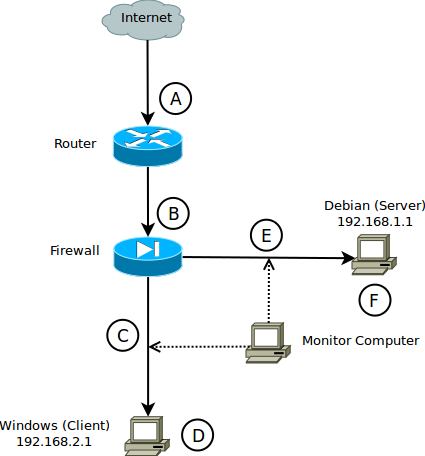 Also in point F there exist three service sensors (one for every service) and both server and client have the OSSEC client installed (the monitor computer is the server of the OSSEC distributed architecture and the one that monitors the traffic in every network-based sensor). The next step contains the attentive creation of the worksheet showing the vantage of the last picture. 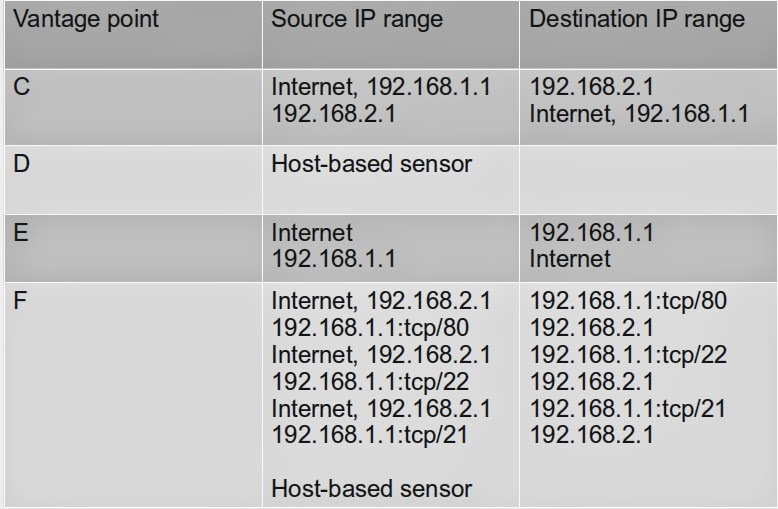 Host-based sensors are necessary for every connected machine. The advantage of host-based sensors is that they can monitor logins, logouts, file accesses etc. 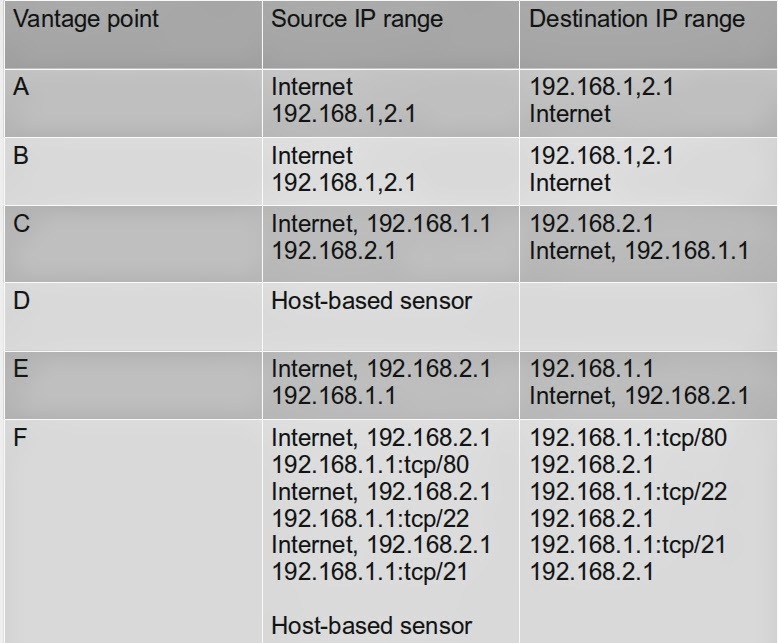 Nonetheless, you can implement host-based sensors only on hosts that you know about their existence in the network. Regarding service-based sensors, it is recommended that we place one sensor for every service our server runs so as to view traffic related to these services. Points A and B has the same vantage. From points B, C and E in order to achieve minimal redundancy with maximum visibility we should choose whichever two points, applying some kind of filter in one them. In my opinion, network-based sensors at points C and E satisfy most of our needs. This is true because in case of applying NAT in our two networks (DMZ of Internal Network) sensors in points C and E are capable of distinguishing different IP addresses. The filter i suggest that you apply is the one that gives the following table (appropriately filtering the sensor in point E). After this process we extract the desired table which is the one that gives the best results.